I have another Christmas card today that includes retired SU! dsp and a long-retired SU! image. This little stamp is from a SU! set my DIL sent me when I first began stamping many years ago. 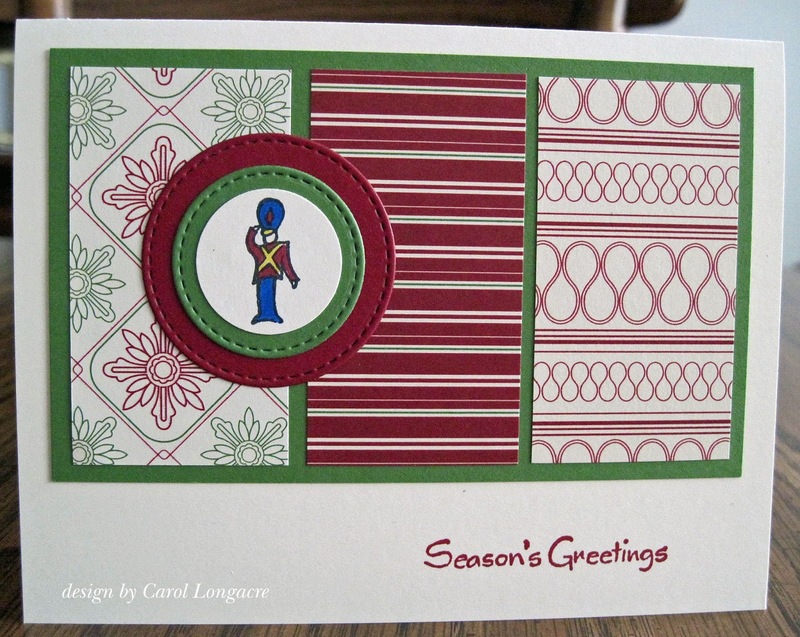 It has lots of small Christmas stamps, and I've used the nutcracker/toy soldier image with some Lil Inker stitched circles of cherry cobbler and gumball green. The sentiment is by Northwoods done in cherry cobbler on a white CS base. Hi Carol, I love your arrangement of patterned paper on this lovely card, they are a perfect backing for the little toy soldier. I like the traditional Christmas colours as well, also on yesterdays card which I seem to have missed. I very much like the layout on that one too. I'm wearing a sweater because it feels so cool! Oh, it *is* that cool with the usual too much air conditioning in an office building thing. Love this card! The papers and the layers and the wee image. This is a good way to make a small image be the focal point of a regular sized card. This is gorgeous Carol. Love this style. Wonderful design, Carol. Love the little toy soldier! Love this card Carol. That design is cool. I wish the temperature was the same...COOL. Great Christmas card. My daughter would especially love this one. she collects Nutcrackers! And another beauty Carol - showing off the little soldier so perfectly. You have made a great use of this little Christmas stamp, it looks so well, a lovely catch eye! Beautiful design and paper, too! Super Christmas card! Clean and lovely! Thanks for joining in the fun at Tuesday Throwdown challenge! 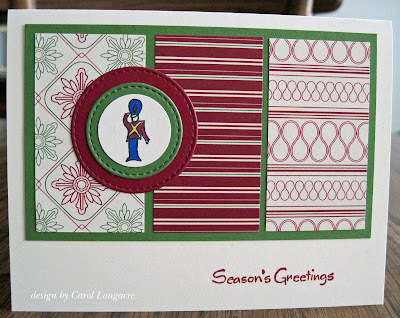 A fabulous Christmas card Carol, such lovely traditional colours. What a fabulous project, Carol. Love the traditional colours on your card. Thanks for joining the Christmas In July challenge at Tuesday Throwdown. Wonderful papers and layout. I love the faux stitching die and image. Thanks for joining us at Tuesday Throwdown. That's fun to be using one of your first stamps! He's a cutie too. Love the patterned paper you used for this. Terrific Christmas card! I really like your paper choices along with the little nutcracker. So glad you joined us at Cardz 4 Guyz.